Introduction to Content Administration in WS.WebTV. General considerations for creating and organizing content in WS.WebTV. Although WS.WebTV has been designed to look good on most Web Browsers, for content administration it s specially important to choose a fast one. For content administration we recommend you to use the latest versions of Chrome, FireFox, Opera, Internet Explorer 9+ (IE9+) or Safari (on Mac), likewise, we do not recommend IE8 and lower and Safari for Windows, because they are slow. Additionally, the minimum supported version of Internet Explorer is 9. In any case, we encourage you to try different Web Browsers and choose the one that you feel works better in your system/OS. Clips are the main elements of the WebTV; they contain the video files. However, in order to display the Clips in the WebTV you need to organize them into Channels and/or Categories. IMPORTANT: The WebTV must have at least one active Channel (Video Channel, Page or Portal). Video Channels are playlists. They playback, in continuous loop, a sequence of Clips. Additionally, Channels can be used to organize Clips. Text Channels are pages which can contain any text or HTML code. They are great to include textual information. Categories are used for organizig Clips, Channels as well as Galleries, News and Events. They can also have sub-Categories. The News & Events extension allows you have News and Events sections in the WebTV. News and Events can contain a main image, text/HTML description and an image gallery. Events are similar to News; however, Events can have a geographical location as well as a time range and associated documents. Additionally, when an Event is "ongoing", the WebTV will display a notification message to inform the visitors about it. By default, the WebTV will use the first active Channel (Video Channel, Page or Portal) as the Home page; however, please note that you can manually select the Home Page from Configuration > General / Home Page. The most important thing is that you think how do you want to organize your content, then decide which is the best workflow to achieve it. - Create Video Channels and associate the Clips to them, by editing the playlist. - Create Text Channels (pages) - if required. - Create Categories - if required - and associate Clips and Channels to them. - Create a Custom Menu - if you need full control over the menu items and its organization. - Associate Clips to Channels from the Clips or from the Channels. - Create Text Channels (pages) - at least one, to use as Home Page. - Associate Clips to Categories from each Category or from the Clips. - Associate Clips to Categories from the Clips or from the Categories. NOTE: In any case, you can always reorganize your content the way you want and use the workflow you think is better for you. Content lists (Channel, Clip, Category, News, Event, Gallery, etc. lists) share a similar interface. 1) Search: Search on the title of the content (search is not case sensitive). 2) Filters: To restrict the list results. The filters also apply on searches. 3) Batch Actions: The "Batch Actions" text buttons are activated only when there is an item selected on the list. Actions generally available are: Activate, Deactivate, Delete, etc. Some actions like Associate/Dissociate Category, Search and Replace Text or Quick Edit might not be available in all lists. It is worth noting that you can easily search for content created by a User, using its ID or Alias. Search by User ID, Enter (user) followed by the User ID into the search field. The previous will search the content created by User with ID = 1. Search by User Alias, Enter (user) followed by the User Alias, into the search field. The previous will search the content created by User with Alias = "john". Please note that the alias entered in the search field must fully match the User alias, except for the case (remember that search is not case sensitive). Search by Tag, Enter (tag) followed by the Tag, into the search field. The previous will search the content which contain "mytag" in the "tags" field (remember that search is not case sensitive). Search by User ID AND term, Enter (user) followed by the User ID + comma + term, into the search field. The previous will search the content created by User with ID = 1 which matches the string "trailer". Search by User Alias AND term, Enter (user) followed by the User Alias + comma + term, into the search field. The previous will search the content created by User with Alias = "john" which matches the string "trailer". Please note that the alias entered in the search field must fully match the User alias, except for the case (remember that search is not case sensitive). Search by Category ID, Enter (category) or (cat) followed by the Category ID, into the search field. The previous will search the content associated with the Category ID = 9. Search by Category ID AND term, Enter (category) or (cat) followed by the Category ID + comma + term, into the search field. The previous will search the content associated with the Category ID = 9 which matches the string "morning". Search by Category Title, Enter (category) or (cat) followed by the Category Title, into the search field. The previous will search the content associated with the Category with Title = "Action Movies". Search by Category Title AND term, Enter (category) or (cat) followed by the Category Title + comma + term, into the search field. The previous will search the content associated with the Category with Title = "Action Movies" which matches the string "stars wars". 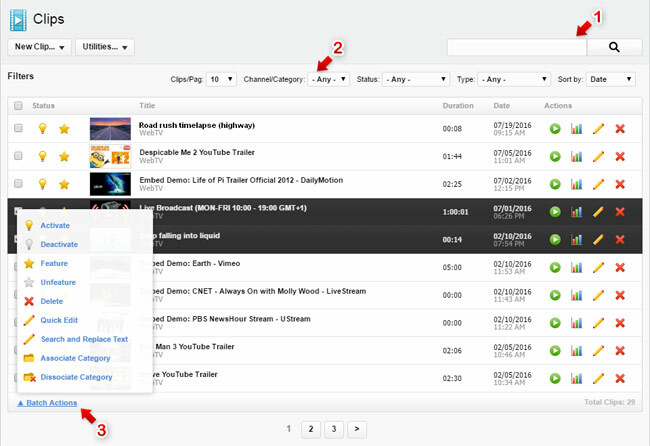 Search by Channel ID, [only for Clips] Enter (channel) followed by the Channel ID, into the search field. The previous will search the content associated with the Channel ID = 2. Search by Channel ID AND term, [only for Clips] Enter (channel) followed by the Channel ID + comma + term, into the search field. The previous will search the content associated with the Channel ID = 2 which matches the string "night". 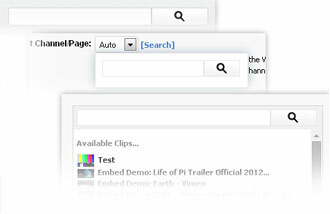 Search by Channel Title, [only for Clips] Enter (channel) followed by the Channel Title, into the search field. The previous will search the content associated with the Channel with Title = "News". Search by Channel Title AND term, [only for Clips] Enter (channel) followed by the Channel Title + comma + term, into the search field. The previous will search the content associated with the Channel with Title = "News" which matches the string "night".